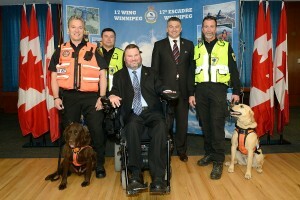 17 WING WINNIPEG, MANITOBA — (Marketwired – May 3, 2013) – The Honourable Steven Fletcher, Minister of State (Transport), and James Bezan, Member of Parliament for Selkirk-Interlake, on behalf of the Honourable Peter MacKay, Minister of National Defence and Lead Minister for Search and Rescue, today welcomed new funding for two new search and rescue projects as part of an $8.1 million federal investment in search and rescue prevention and response in Canada, through the Search and Rescue New Initiatives Fund. “These projects, funded with $248,000 under the Search and Rescue New Initiatives Fund, will significantly improve the search and rescue capacity and capability for Manitoba and reinforces the Government of Canada’s commitment to improving search and rescue,” said Minister Fletcher. The Search and Rescue Association of Manitoba will receive funding of $168,000 to expand into several northern communities and urban centres that have high populations and potential volunteers, but do not currently have search and rescue teams. As well, the Province of Manitoba Search And Rescue Dog Association will receive $82,000 for the purchase of equipment and the training of new K9 teams in Manitoba. This project’s objective is to increase the effectiveness of the volunteer search dog teams in the province and help ensure their safety, while allowing them to do their job more effectively. “Both these initiatives will assist our search and rescue volunteers across Manitoba, and strengthen our already robust Search and Rescue system for Canadians who are lost or in distress,” said MP Bezan. This project is just one of many Search and Rescue New Initiatives Fund projects being funded to strengthen search and rescue prevention and response. Individual initiatives will allow for the purchase of life-saving and specialized equipment and tools for search and rescue organizations throughout Canada; enhance search and rescue volunteer capacity; improve the measurement of avalanche risk; as well as support collaborative multi-agency interoperability exercises within the Atlantic Region of Canada. Through technology, sustainability and interoperability, these projects will contribute to the continued efforts to build capacity for the National Search and Rescue Program in the areas of search and rescue prevention and response. 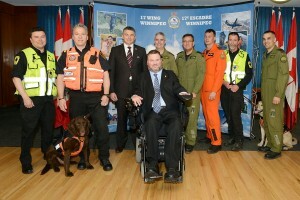 The Search and Rescue New Initiatives Fund was established by the federal government in 1988 and is managed by the National Search and Rescue Secretariat, on behalf of the Lead Minister for Search and Rescue, in partnership with other federal, provincial and territorial search and rescue organizations. The Search and Rescue New Initiatives Fund is the cornerstone of the National Search and Rescue Program and has provided more than $200 million in funding to over 880 projects that have contributed significantly to advancing search and rescue related technology, improving Canada’s ability to provide prevention programs as well as providing economical and effective search and rescue response in all areas and jurisdictions across Canada.